Home » Resources » Infobases » Invasive Alien Plant Alert » Lythrum salicaria L.
Lythrum salicaria L. is a perennial herb, 2 m tall. Stems erect, numerous, four-angled, from root stalk up to 2.5 m high. Leaves opposite or in whorls of three, hyphenate grass green in colour, 3-10 cm long and 1-2 cm wide. Flowers rose-purple, 10-15 mm in diameter, forming a dense spike 150-250 mm long. Fruits small capsules, 3-5 mm long. Seeds small, numerous. Flowering time: throughout summer. Native to Europe, Asia, Northern Africa and Australia. Invasive in Canada, U.S.A, South and West Africa. 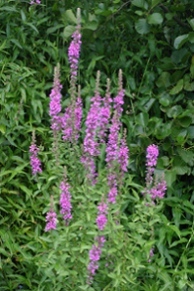 Purple loosestrife was introduced into South Africa either accidentally or for ornamental purposes. It has been recorded only in the Liesbeeck River in Cape Town. Purple loosestrife invades natural and disturbed wetlands, such as stream banks, lakeshores, marshes, fens, canals, reservoirs, and sub-irrigated pastures. Once the plant is established it can tolerate drier sites, posing a threat to agricultural lands and pastures and also quickly crowding out native vegetation. 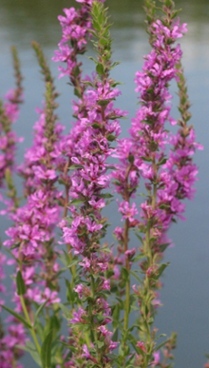 At high densities, purple loosestrife can create near-monocultures. Purple loosestrife spreads by seed. It may also spread vegetatively from root or stem segments. Once established it becomes difficult to eradicate Lythrum salicaria. Mechanical control can be used at an early stage of growth. No herbicides are registered for this plant in South Africa, but Seismic, an aquatic friendly systematic glyphosate (approved by the register on a trial basis) has been effective so far. Report sightings of these plants to the Invasive Species Programme at SANBI. We will need to know its locality (the exact locality, supply a photograph any landmarks or GPS information if possible). Invasive species in South Africa. 2010. Lythrum salicaria. Working for water nursery partnership programme. South Africa. South African plants invaders atlas database. ARC – Plant protection research institute, Pretoria, South Africa. Farnesworth, E.J., and D.R. Ellis. 2001. Is purple loosestrife (Lythrum salicaria) an invasive threat to freshwater wetlands? Conflicting evidence from several ecological metrics. Wetlands. 21: 199-209.